There’s been much chaos in my life lately…. Dashing between two houses, fixing up one to live in, fixing up one to sell, both of us working jobs, and trying to balance everything? I am failing BIG TIME! We went into this with our eyes wide open; we knew it would be hard and busy and no downtime. After two years? I’m tired. Mr. H. C. is tired. We have iron-poor blood. Burnout with a capital B; Exhaustion with a capital E. I just want to sleep for three weeks straight. In about three weeks the job that I have loved for nine years will be ended, our city house will be on the market (or soon will be) and we will be gently moving all summer (or until the house sells) to this unfinished cottage. Just looking at this ToDoList makes me tired. (You might notice that Write Blog Post is not on the ToDoList.) And this is only my list; it doesn’t begin to cover Mr. H.C.’s list. We need this weekly rest. God knew it and named it — Sabbath rest. It is restful to sit here and look at the sky and the trees and listen to the bird song and the trill of a woodpecker. Today it’s a little chilly, so I have a blanket and a kitty for warmth. Yes, there is a breeze. There’s a ton of stuff I have to do. I see my ToDoList when I close my eyes. I hear the world’s voice in my worries: If you don’t get that house on the market by June, it will never sell. And then what will you do? You need to be more efficient with your time. Etc. Etc. And then sometimes, when I’m listening, I hear the still, small voice: Peace my child. I am in control. Give me your worries and submit to my time. That’s what a Sabbath rest is for, and it is why God ordained it. He knew we would never stop working, shopping, tending, doing, (add your verb here) long enough to listen for His voice. And so for today, I am efficiently using my time — resting and listening and banishing any visions of a ToDoList that might flutter across my eyes. Ah. The dreaded “To do list” – I just found the one I made about a month ago. I can cross off ONE item. And it is very small. It is very hard to surrender to Sabbath Rest, but, oh so necessary. Occasionally I actually do! If your city house is not ready by June the world will not end. Fall can be a very nice time to showcase a house! Let’s get together this summer and sit on your porch. 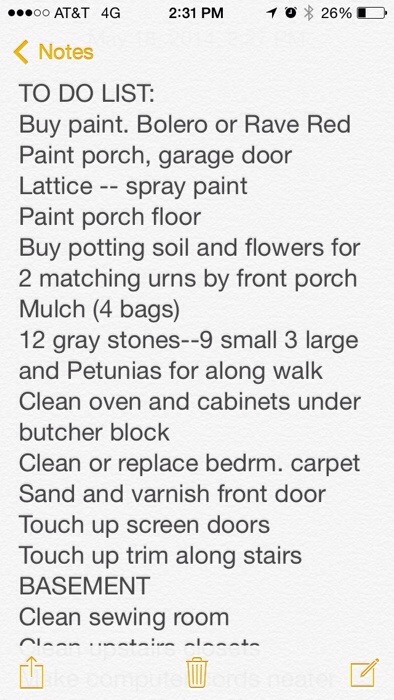 My old house “To-Do List” evolved into the “Unfinished Project List” so I threw it away. Now I just make a plan for the day. Today’s was to give my brain a rest from sorting through the mountian of files lurking in the basement for the past two weeks. I’m now “working” on my third NASCAR race of the weekend. I can assure you that the projects will wait an extra day/week/month/year/decade. Perfection is not really necessary since most people who buy a house want to make it their own by painting, etc. Just work in the items that will help with a quick sale: curb appeal and clean. Keep listening to that “still, small voice” – He has all the answers we need, as well as the peace and the strength for every task and every moment. “And then sometimes, when I’m listening, I hear the still, small voice: Peace my child. I am in control. Give me your worries and submit to my time.” …. AMEN! Yes. It really is. I hope your days ahead will be much easier for you than you anticipate them to be. It’s hard to make the actual move from one home to another. Transitions are hard . . . and a lot of work. But when I’ve moved I’ve always loved the feeling after the move–as boxes are emptied and my possessions are in new spots in my new home. Yes, I’m excited about it as well! The biggest problem is we have too many possessions for our new “little” house. What to keep and what to reduce? Sigh…I’ll be glad when it’s finished! It’s true! Everything you want is always at the other house! I cannot wait to get it all pared down; but I am still wistful about leaving — the house looks lovely now that it is fixed up to sell!!! Best wishes to you too. I sure am hoping that this is our last move. Me too, well except for retirement somewhere’s on the Island (as in Vancouver Island). I hope you’ve had MANY Sabbath rests since this post came out. And I’m praying that you’re finding your to-do list dwindling right before your very eyes – with energy to spare! Yes. My list is getting smaller. I’ve crossed off a few Big items, but there are still several Big Items left — like clean the sewing/craft room. That means getting rid of all those unfinished projects. Could be cathartic, yes?